The Panda Bear is a perceptive observer of the stresses of modern life. She is a critic of the culture of extreme busyness. She is the voice of the humble and confused. When the Panda Bear discusses current affairs she discusses the truth as she knows it. This blog is not intended to report political facts. The Panda Bear will be doing some short posts because she gets tired at night. She had just read an article about how it works to the Capitalists advantage to work people long hours. The Panda Bear actually thinks the economy would function better with more leisure because people would have more time to spend money. However, the Panda Bear thinks that the Capitalists like getting people into debt where they are obligated to work to pay off their debts. Also she thinks that politicians benefit by people going into debt because it provides the illusion that the economy is growing and that wages are rising which they have not been doing. For better or worse in the post Keynesian era politicians are seen as being responsible the economy; consequently they do things to make the economy look like it is doing well. Here is a link to the article the forty hour work week which inspired this post. he Panda Bear was reviewing articles on the web and she came across a tribute to Shirley Chisholm who was a black congresswoman who ran for president in 1972 under the Democratic party. The Panda Bear remembers Shirley Chisholm when she ran. The Panda Bear admired her. Here was a woman who had grown up disadvantaged and represented a poor community who was running for president. She challenged the Democratic establishment. Her motto was unbought and unbossed. Contrast this to some of women Democratic leaders now namely Hilary Clinton and Nancy Pelosi who grew up in comfortable circumstances and are very establishment. The Panda Bear sometimes gets nostalgic for the Democrats of old. She recently read a book by someone who worked for the Truman administration who supported a bill guaranteeing full employment to all Americans who wanted a job. Of course, the Panda Bear realizes that this would be a practical impossibility. However, since 2008 its seems that the Democrats have been very tolerant of high unemployment rates and have done very minimal to help people get jobs. She is not surprised that they lost the election. What inspired today's post was not politics but rather the longer days. It used to get dark at 4:30. Now it gets dark at the late time of 5:09. The Panda Bear used to get so tired at 6:30. It had been dark for two hours and it seemed like it was the middle of the night. Now with longer days the Panda Bear can stay awake later. Furthermore, it seems that one day it will stay light until 9:00. Oh joyous day!! Furthermore, the Panda Bear has lost five pounds since January 1(her goal is to lose another twenty-five pounds). However, at times she still feels somewhat down. Part of it is probably the winter blues. The days are short. It is harder to get out to see people. Furthermore, the Panda Bear is developing cabin fever from being inside so much. 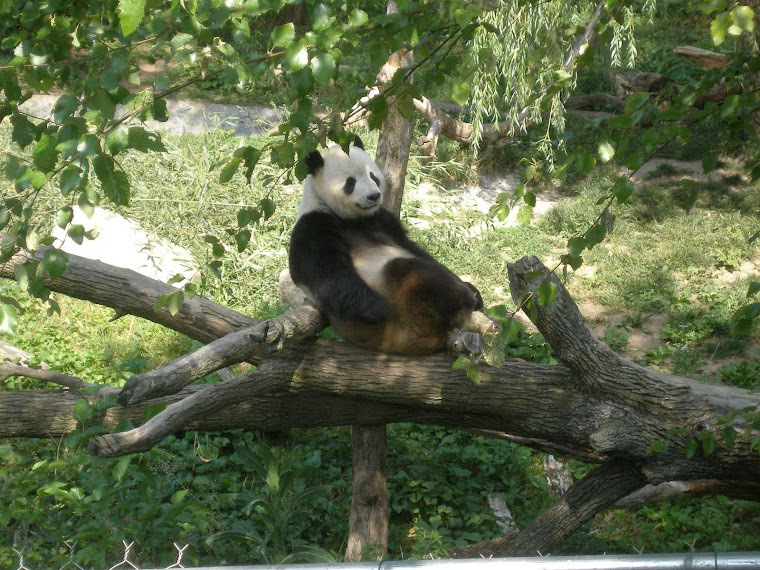 For some reason the Panda Bear has been thinking about the nature of success. The Panda Bear defines success as obtaining a goal. She thinks of a quote from Oscar Wilde that went something like this: There are two tragedies in life. One is not getting what you want and the other is getting it. The Panda Bear thinks there is a lot of truth to this statement. She thinks the reality often is a disappointment compared to the dream. Usually the reality is a lot more work and not is pretty nor as glamorous as the fantasy. On the other hand, the Panda Bear thinks(she thinks she got this idea from Buddhism), that in the long run we are happier in reality free from our illusions. Part of maturing is exchanging the fantasy for the reality. The Panda Bear Blog is a blog about an ordinary office worker who wants to change the world. In a previous post, the Panda Bear had written about her New Year’s resolution to lose weight. She even was so bold to state that she had lost a few pounds. Well pride comes before a fall. The Panda Bear unexpectedly had to have gum surgery. Because of the surgery she could only eat soft foods that are room temperature and because she had to restrictions on exercise she gained some of her weight back. However, she now ia feeling better and plans to return to her diet(Here is an exercise tip -instead of exercising for an hour straight break it up into two half hour sessions. It is just as much exercise and it is not as tiring as exercising all at once). The Panda Bear mentions this because many events that we cannot predict can slow us down from reaching our goals. Instead of beating ourselves up for not sticking to our goals we must simply forgive ourselves and start all over again. Though this was not a New Year's resolution, the Panda Bear has started to subscribe to a newspaper and tries to read it every day. She decided to start reading the paper not just because of the "fake" news. The Panda Bear felt she was uniformed of some basic facts. She like Gary Johnson, the Libertarian presidential candidate had her Aleppo moment. Like Gary Johnson the Panda Bear believes that the US providing the Syrian rebels with arms has increased the bloodshed in the area and is imperialist. She also was not aware of what going on in Aleppo (though she did know that the civil war is destroying Syria). However, it was really on a local ballot question that Panda Bear was truly confronted with hers and others ignorance of what is going on in the news. In Massachusetts, there was a referendum question on whether to expand Charter schools in areas where the public schools are low performing The Panda Bear strongly supported this measure. The public schools in city of Boston are a total mess and have been for the past fifty years, The Panda Bear works with many people who live in the City of Boston and they use the Charter schools. However, when the Panda Bear stated her support for the resolution to expand Charters schools on Facebook many of the Panda Bear's friends disagreed. What bothered the Panda Bear was not the disagreement but how neither she nor her friends were uncertain of the facts surrounding Charter schools. Were they free? Were they part of the "public” schools system? Were they regulated? Well in reading today's newspaper the Panda Bear found out that the Charter schools are regulated by the state. (The Panda Bear believes Charter schools are free). The Panda Bear always heard growing up that the gold standard for news was newspapers-not radio or television. Her local paper done some good investigative journalism and does contain opposing views. However, it still perplexes the Panda Bear when newspaper editors discuss how they failed to understand public sentiment during this election. The Panda Bear wishes to tell academia, the media and politicians that one trait of the ordinary person is that there are a lot of us. We are not some rare species that has not been seen for decades. Common people are like pigeons, squirrels and sparrows in the city. If the common person is not seen by the press it is because they are not looking. Like many living creatures, this year the Panda Bear is resolved to lose weight. She has gained twenty-five points over the past twelve years. In addition, the Panda Bear has over the past two years has developed knee pain; she has been told that reducing weight would lessen the knee pain (there would be less weight on her knees). However, the subject of weight loss makes the Panda Bear aware of life's inequalities. Men can eat more than women without gaining weight. Tall and large boned people can eat more than short petite people. Furthermore, as people get older their calorie needs decline. As a small woman, the Panda Bear has always been a small eater. Even when she was a child she had to go on diets. However, the Panda Bear has discovered that dieting is harder as one gets older. Furthermore, with knee arthritis she has some activity limitations. Though for most people the cause of weight gain is the same (eating more calories than one needs), the absolute food calorie requirements of people are different. It seems so unfair. However, after raging about the nature's great injustice, the Panda Beat has lost five pounds during the holiday season no less. The Panda Bear knows her downfall is that she eats too much after work/in the evening. Slowly the Panda Bear is working on changing her eating habits. Recently, the Panda Bear has heard of some weight loss strategies which she thinks has a downside. Some people takes bets on who can lose the most amount of weight over a certain period time. Another is to set a goal to of a certain number of pounds by a certain date. The problem with both strategies is that they depend on things outside a person's control. While one does have control about how many calories one eats, one does not have control of how much or how fast one loses the weight. Some kinds of weight easier are to take off than others. The Panda Bear has heard that the last ten pounds of weight loss can be slower and harder to take off than the first ten pounds. Older people tend to lose weight more slowly than young people.